The best party I’ve been to on board a yacht was a summer party in Antibes port, hosted by a fabulous young couple on their super impressive yacht. Guests entered via a red carpet and were serenaded by Vanessa-Mae at the pre-dinner reception, where we enjoyed champagne cocktails before making our way down to their nightclub (a permanent fixture on board). Limited Edition Event Design produced the party and, among many highlights, filled the swimming pool with 250 goldfish. One of my other all-time favourite superyacht parties was a Pirates of the Caribbean do. This small party was held on board a 75 metre last year in St Barths, and guests were all sent custom pirate outfits and the decks were covered with skulls, crossbones and pirate booty. Rum cocktails were served in handled mugs and chocolate volcano cake was presented in individual mini treasure chests. 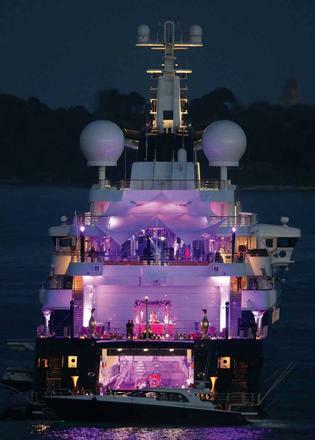 Paul Allen throws a party on board Octopus, his 126 metre superyacht, during the Cannes Film Festival. It is always themed and stuffed with A-list guests – making it a Cannes favourite. Jake Gyllenhaal, Sienna Miller, Kristen Stewart, Kate Moss and Sarah Ferguson, the Duchess of York, have all partied away on board. Previous themes have included Bollywood and A Midsummer Night’s Dream, with fairy light-covered trees and faux grass flooring. 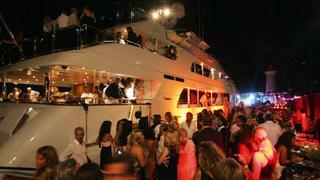 The biggest yacht party fiesta is without doubt Saturday night at the Monaco Grand Prix. Yacht after yacht is lined up, full of bright lights and loud music, as the harbour becomes party central for the yachting jet set. If superyacht soirées have you thinking of garish champagne and caviar parties, you are way out of date. These days they are all about understated elegance, with fewer guests and more high quality production. More and more hosts want to return to the era of fine dining and they incorporate this regardless of the party size. Celebrity chefs are the new party rock stars and the uber elite are flying them in to cater for them. Creating the tastiest and, more importantly, the healthiest menus is now the craze. Most superyacht chefs get sent to observe and assist in the owner’s favourite restaurant kitchens for a few weeks a year. Now they are being sent into spa kitchens too. What to offer? A steady stream of healthy bowl food passed around by staff all through the night. Sushi? Make sure it’s brown rice. The arancini? Black rice fried in coconut oil. Even the desserts are free of sugar, gluten and dairy. The key to a good party is booze – strong enough to get the job done and tasty enough so you don’t notice. Espresso martinis are out and teatini is in. Made with jasmine pearl tea, mixed with bourbon, apple juice and agave nectar, it is then shaken and strained into a martini glass. Sensational. For the older crowd a good vintage Bordeaux never goes out of fashion. Music sets the tone for a party so you have to get it right. The big bands are so last season; now it’s DJ only, regardless of the age of the crowd. And star singers are being flown in only for a song or two. Banana Split events flew Tony Hadley on to a yacht in Monaco last summer to sing one song – Gold – because it was the hostess’s favourite. It’s all in the details and the hosts with the most know how to do detail. Limited Edition Event Design put together a Japanese themed party on board a superyacht in Mexico, where the hostess wanted cherry blossom trees to line the helipad. So 3,000 fake cherry blossoms were sourced and it took staff three days to hand stitch them on to real branches. Special touches with tableware, glassware, uniforms and flowers go a long way. Individual shoe boxes or shoe bags embossed with the boat’s logo can safely hold all the guests’ shoes as they enter. Emboss and engrave everything. Stamp the boat’s logo on the cocktail napkin, colour matched to the design scheme. Have your own scented candles made to scatter round the party, with your vessel’s name and logo engraved on the label. Aleksandra and Andrey Melnichenko on Motor Yacht A. Hail the king and queen of entertaining. They are reclusive, and protective of their privacy, but when they entertain nobody does it better. I danced the night away one New Year to Aleksandra’s childhood favourite Matt Goss in her personal nightclub. Dasha Zhukova and Roman Abramovich on Eclipse. Their pre-New Year’s parties on board in St Barths are the hottest of tickets. Len Blavatnik and Harvey Weinstein on Odessa II. Philanthropist and businessman Blavatnik and film producer supremo Weinstein co-host an annual Business of Film lunch on Blavatnik’s Odessa II during the Cannes Film Festival. Last year it was so crowded that apparently even Mick Jagger was turned away. Paul Allen on Octopus. 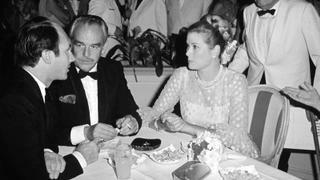 His themed party during the Cannes Film Festival is legendary. Denise Rich on Lady Joy. Her annual summer yacht party in Saint-Tropez attracts an older crowd – and a good percentage of the Fortune 500.